Kambourakis or Meropi in Kamares has authentic Sifnos food and the freshest meat and fish. If a late afternoon ouzo with octopus, cucumbers, tomatoes, olives and feta cheese while gazing at the fishing boats gently swaying in the breeze is what you came to Greece for, you've found it. Andonis runs the kitchen and is also one of Kamares best fishermen. The food is served by an assortment of wives, sisters, cousins, mothers and aunts and comes from the sea or from their own farm. Try their revithia keftedes which are fried balls made from chickpeas, similar to falafal. Very good homemade wine and in the summer Amstel Beer on tap. No, not Amstel Light...real Amstel. Just go into the kitchen and they will show you what's for dinner, or lunch. Try their octopus marinated in olive oil, their caper salad, eggplant with cheese, and familiar favorites like mousaka and stuffed tomatoes. Shown in the photo is one of their specialties: Spaghetti with Lobster Sauce which they may or may not have. Last time I went here and ordered an ouzo and meze (ask for Pitsalidi or Yianatsi ouzo) they gave me cheese-stuffed jalapeno poppers. I kid you not. Right next door is their well stocked Meropi Supermarket where you can buy just about anything you need from deli foods to yogurt to pampers and even top shelf Tequila! CLAUDIO'S ITALIAN RESTAURANT: Let super-chef Paolo from Trieste, Italy and his beautiful wife Monika, wine and dine you in the finest Italian restaurant in the Aegean. Local and imported wines. Fantastic pastas, salads, fish and meat. Great pizzas and calzones too! This would be considered a fine Italian restaurant even if it were in New York City or Milano. The fact that it is in Kamares, Sifnos is a blessing for anyone who has tired of Greek food or wants to visit Italy without shelling out the airfare. Here's a tip: If you have a before dinner drink at the Old Captain Bar they will give you a discount card for Claudio's. Then after you eat at Claudio's they give you a free drink card for the Old Captain. A great way to save money and eat well. I like the Spaghetti Puttanesca, carbonara and the Zingara Salad. Amarandi loves the pizza with pesto, tomato and basil. Claudio's serves as the unofficial Italian Embassy for the island. That's him in the photo (sitting) with famous Rock star Parthenon Huxley of ELO. Captain Andreas Fish Taverna on the beach was at one time the best restaurant in Kamares. But as other restaurants improved, their fortunes receded. Still it is a nice place to eat and being right on the beach makes it the perfect place for lunch in Kamares. Their fish soup is fantastic and there is usually a large assortment to pick from including barbounia (red-mullett), ksifia (swordfish steak or souvlaki) and astrako (lobster). They also have grilled meat dishes and oven cooked specialities. If you have children who don't want to sit around after eating you can move next door to To Kima where Kyria Eleni makes the best baklava and frappe (ice-coffee). Her daughter Maria now only comes for part of the summer but in the past she had the heart of every male traveler in Kamares. Giorgos Boulis Taverna: Giorgos “Boulis” Kalogirou use to run a taverna on the waterfront but moved it to the town square just up the street on the way to Apollonia some years ago. Boulis was a familiar sight on the waterfront, sometimes waiting on 20 tables at a time and keeping the whole enterprise together. Where the tavern use to be on the waterfront is now a Zacharoplastion (sweet and pastry shop) run by his son Spiros. Boulis moved because he wanted a bigger place with an atmosphere of a traditional taverna. Boulis’ son Antonis helped run the taverna for some years – but has now opened his own place inside the Hotel Boulis (see below). Boulis retired a few years ago and his daughter Flora took over the tavern cooking all sorts of meat, like whole roast lamb, kokoretsi, steaks, chicken, souvlaki, paidaiki (lamb-chops). The meat is absolutely excellent and comes from another brother Jannis – who is running the farming side of the family business, also producing fantastic cheeses – try his mizithra (fresh cheese) with onion, capers and olive oil, fresh bread and the house kokkino (red wine) and you will know what Greece is all about. Or his matured cheese – Manoura goes perfect with kokkino or ouzo. There are also many baked dishes, salads and mezedes. Flora has added a woman's touch and made it a little fancier and renamed it Boulina's but still with a strong traditional touch. And you must try her smoked aubergine – fantastic. 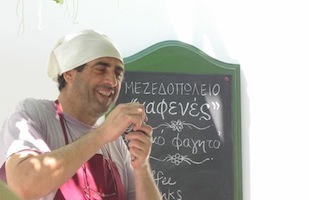 Antonis (son of Boulis) has opened a kafenés in the courtyard of the family’s Hotel Boulis. Kafenés use to mean a small place where you could get anything from snacks to meals to coffee to drinks to sweets but only a limited (and seasonal) range of each thing. Antonis has taken the traditional cooking of Sifnos that he learned from his mother Kassiani Kalogirou – a fantastic woman - and without compromising given it his own “twist”. This produces some of the best Greek traditional cooking I have ever had. And he still can serve cold retsina (resinated wine) from the barrel – something that sadly enough is becoming increasingly rare. The place is relatively small (seats about 30 – 35). It just may be the best ouzerie-mezedopoulion in Kamares if not on the island. 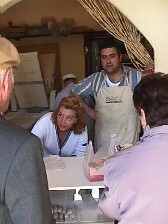 Spiros runs the bakery right next to the zacharoplastion. A visit here is essential because Spiros has done a great job of making sure the shelves are filled with the finest in local pastries, cakes and cookies, all baked on the premises. My favorite is the amegtholota which are these oval shaped almond cookies made mostly from almonds and sugar and little else. I swear that I could live off these things and I am not a sweet and pastry person by nature. In the glass case he has a variety of beautiful looking pastries that my daughter goes crazy for and in the window tiropitas (cheese-pies) and cheese pastries. In the summer he makes spanakopita (spinach pies), depending on the availability of spinach on a particular day. I would come in daily to ask for one and eventually I would not have to say anything. Spiros would just shake his head yes or no. He also makes these special almond cookies which may also be called amegtholota, but these look like cookies and since everything is well displayed you can just point to what you want. Try everything. It's all good. Spiros also runs the zacharoplastion, which is also an ice-cream shop, talking over for the Joy Cafe which bit the dust after years of dominating the ice-cream and yogurt with fruit honey and nuts market. You can get fresh orange juice, breakfast, espresso drinks, beer, ouzo and anything short of a meal. Simos Restaurant is one of the three 'real restaurants' according to Stavros Kalogirou. 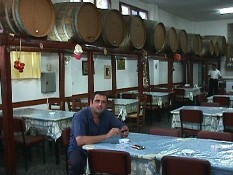 As he explained it to me the three real restaurants in Kamares are Sophia's, Kambourakis Meropi, and Simos. What makes them real is that all three have farms that provide the cooks with all the vegetables, meat, olive oil, wine etc. But many of the other restaurants must buy everything they serve. It is interesting that the three 'real restaurants' are among my favorites and that includes Simos. Like the others it is family run and the best way to choose your meal is to go into the kitchen and let them show you what's in the pots. Really good fish soup and wonderful Rivithia (chickpea soup). Greek salad with Mizithra too. I love how Mrs. Simos sits down at our table to take our order. It could be because of all the restaurants in Kamares they have the most comfortable chairs. This may not seem like a big deal to you know but when you get to Greece and your posterior has become familiar with the straw chairs that are both popular and hard to sit in for long periods of time you will understand. Simos is one of the few restaurants that is open year round, along with the popular Cameron's, across from the Old Captain which specializes in Greek and Italian food. Similar to Simos and Meropi is the last restaurant on the waterfront, or the first one you come to when you get off the ferry, called Posideon but known as Sophia's which you will understand why when you go there. Sophia, the owner, is a bundle of energy going back and forth with trays of food and making customers feel like they are old friends. Excellent island food, fresh fish, the usual salads and Sifnos vegetables and katziki mastela (goat cooked in a clay pot-Sifnos style). Good place for a final meal because it is close to the ferry but actually it is a good place for any meal. A very pleasant surprise and one you may not notice is the Absinthe Restaurant Bar, up the steps right next to Andonis Kalogeros pottery shop and across from the Old Captain Bar. With a terrace above the street you have a beautiful view of Kamares bay and the comings and goings of the ferries and sailboats. Though named for the wormwood spirit that inspired the minds of Van Gogh, Picasso, Manet, Emil Zola, Oscar Wilde, Hemingway and others, and brought insanity and an early death to many more, there is more to this restaurant than the famous drink, which they do serve several varieties of by the way. The restaurant features the dishes of Asia Minor, Greece and the near east. Being a purist at heart I was reluctant to eat here but talked into it by my adventerous date. I am glad I did. I went back several times. They have a long list of appetizers of which I strongly recommend the Lazmatzoun which is pita bread with spiced minced meat and yogurt on top, like a flat souvlaki. The meatballs from Smyrna are perhaps the best keftedes I have ever had. There are several smoked and marinated fish dishes including smoked salmon with mustard sauce. Get the cheese pie coated in honey and sesame seeds which sounds like a desert but isn't. Of the main dishes I had the Curried Chicken with Mango and the Fried Pork Fillet with Feta Cheese and Onions, both delicious. Lots of nice shrimp dishes as well as pork and beef. A nice choice of bottled wines and their house wine is pretty good too. George Tambakopoulos, the owner, a former rock star and now a gold coin dealer, treated us to a very nice Brut-Prosecco from Arkadia in the Peloponessos. 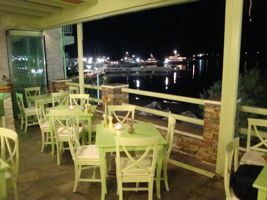 This is also a great place to go for an ouzo, not just because he has such a great selection of meze dishes but because it is on the roof of a building with a view of the harbor and the beach. Though it looks fancy it is not expensive. In fact it is surprisingly reasonable and pefect for a date or a romantic evening. Be sure to order the mixed salad with pomegranet seeds. The chef is a star. Whatever they pay him they should double it or sign him to a 10 year deal. Nassos the Maitre'd is a keeper too. 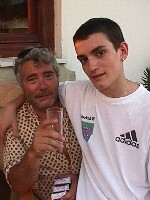 Mama Mia's is owned by Phillipo and his son Andrea who come to Sifnos every summer from their home in Milano. There are two locations, the original on the beach at Platyialos and the new one next to Stavros Eleonas Apartments on the footpath between Appollonia and Artemona. Both are excellent Italian restaurants with the Apollonia location specializing in pizza. The Platyialos restaurant is great for lunch and a swim. Ask to see his collection of 60's 45's and try the seafood pasta. Don't be surprised to see the ex-Prime Minister of Greece at the next table. The Stavros Cafe, next to the Stavros Hotel and the Stavros Supermarket, is not run by Stavros. It is run by Vangelis who used to own the Avra restaurant but realized that it is a lot easier to make money selling bacon and eggs, toast, yogurt with fruit, honey and nuts, espresso, beer, wine, ouzo, orange juice, pastries and ice-cream. When I asked him if it is easier to run a restaurant or a cafe he replied that the cafe was more difficult because you have to wash so many glasses. I had not thought of that. For the best coffee in the morning come here. If you are used to Starbucks quality (or potency is what I really mean), order a double espresso with hot milk. 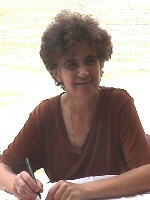 (diploes presso me zestogala sekorista ). But mastery of Greek is not necessary since his sons Christos and Nikiforos work here every day and speak perfect English. For the traditional Sifnos breakfast of yogurt with fruit, honey and nuts come here or go to To Kima run by Kyria Eleni. But for people watching the Stavros can't be beat and you will find me here in the morning whenever I am in Sifnos, along with Paolo from the Italian restaurant who it is best not to speak to until after he has had his second coffee. Further up the road to Apollonia is Nector which has things like eggs benedict and other fancy breakfasts. Across the bay in Agia Marina are a couple restaurants for thiose who want to get out of town but not drive as far as Apollonia. One in the house where Markos the potter used to live is called Isalos and is a sort of traditional but slightly upscale neo-Greek taverna in a beautiful setting right on the sea. Good food. The owner makes his own sardeles pastes (marinated sardines) and lakerda (marinated tuna) using high grade sushi tuna. Nice choice of wines and ouzo, and a menu that changes often with lots of specials. Everything I had here was good. The service can be a little slow at times when they are busy and they might make more friends if they let people enjoy the sound of the waves instead of pop music on tinny outdoor speakers but despite that it is still a nice place for a romantic dinner date. Argiris, a little further is known for excellent grilled meats but can be a little slow in service when it gets busy. Also the restaurant at the Delfini Hotel is supposed to be very good as it should be because before he had the hotel, George ran the Delfini Ouzeri right next to the port police station. On the beach called Apokafto next to the monastery of Chrysopigi is the restaurant of the same name where we went for our Easter dinner. We had roast lamb and the famous lamb mastella which Sifnos is known for it. Instead of roasting it is cooked in a clay pot and let me just say that I was a lamb-on-a-spit fanatic until I tried the mastella. Now I am converted. No more hours spent turning a lamb over an open fire for me. Lamb mastella is awesome. The restaurant called Chrysopigi on the other end of the beach is just as good. In the small port of Heronissos is the Ammodia Fish Taverna famous for their lobster which is caught nearby and also for their variety of fresh fish. It is a twenty minute drive to Heronissos but worth it for the food and a swim in the small bay. It can get crowded on weekends with visitors from Apollonia and Kamares as well as people on sailboats and yachts. You can also try the Fishtaverna Heronissos right next door where you can choose your lobster right out of the sea though at 95 euros for a lobster macaroni you may want to share it with your family and friends. There are dozens more restaurants all over the island. To find out more you will have to come andtry them yourself. Remember that Sunday is Revithia day, order mizithra on your salad rather than feta and that the least expensive fish are gavros, marides, gopes, kolios and kalamaraki(frozen). Also remember that the claypot dishes that are cooked in the oven are some of the dishes the island is most widely known for. While the rest of the Mediterranean was eating hunks of meat cooked on a stick over a fire (or raw) the people of Sifnos were cooking in these same clay pots in ovens.